To Dog With Love: Would Your Dog Dance for Salmon Paws Dog Treats? Review and Giveaway! Would Your Dog Dance for Salmon Paws Dog Treats? Review and Giveaway! Cosmo loves salmon. So when we heard about Salmon Paws jerky treats, we knew we just had to try them. Salmon Paws are made with pure Alaskan Wild Salmon, hand-made and baked, and chock full of Omega-3 and Omega-6 oils. Hard to go wrong with that! And now one lucky To Dog With Love reader will get a chance to win some too. Read down to the bottom of this post for giveaway details. My inspiration for my business comes from my own dogs Zoey and Hudson. I wanted to give them an all natural treat that didn't have any fillers and bones in them which a lot of pet treats have these days. My products are made from the center cut of the sockeye salmon. They are 100 percent pure salmon, human grade, handmade and baked in Bellingham, Wash., at an FDA approved facility. Another focus of my business is that 10 percent of all Internet proceeds of Salmon Paws, premium pet treats, is donated to the Lange Foundation in Los Angeles, a no kill shelter that runs solely on donations. Salmon Paws also offers meal toppers to sprinkle on top of your pet's meal. 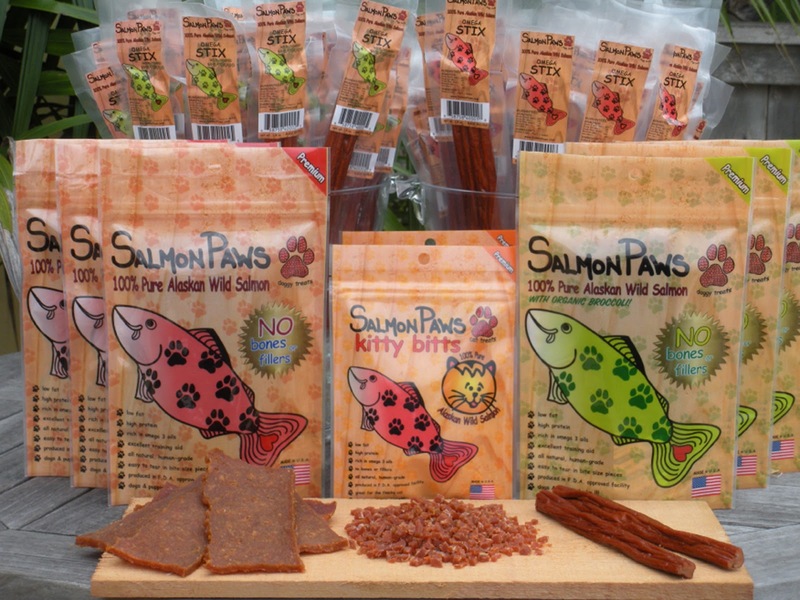 WOWSERS are meant for dogs and made with Salmon, Sweet Potato, Broccoli and Carrots and Kitty Bitts can be enjoyed by either cats or dogs and made with 100 percent Alaskan wild salmon. Find a store in your area or you can purchase Salmon Paws on Amazon.com . Two lucky U.S. winners will have the chance to win either a bag of Salmon Paws Salmon Jerky or a bag of Kitty Bitts.The winners will be chosen at random with random.org and entries must be posted on this blog by 11:59 p.m. ET on Saturday, December 10. Leave a comment on this blog post telling us you are entering our giveaway. Be sure to leave email contact info if your comment doesn't link to some contact information. Disclosure: The products for review and giveaway were provided to TDWL free of charge by Salmon Paws. However, opinions expressed herein are our own. I would love to enter this contest! thanks! I follow Cosmo and To Dog With Love on Facebook. Ooh! My Jack Russels would love to win these treats. We are entering! I like Cosmo Havanese on Facebook! I like Salmon Paws on Facebook! I follow to dog with love on Twitter! My dogs love fishies! I'm entering the giveaway. Can we tweet daily or just once? I like To Dog With Love on Facebook. I like Cosmo Havanese on Facebook. I like Salmon Paws on Facebook. I follow Cosmo Havanese on Twitter. I follow To Dog With Love. My twitter handle is @cynth201. I Like Cosmo Havanese on Facebook as Kelly Ann T.
These treats look great. I'd love to try them with the dogs : ) I'm entering, thanks!